The Auto Focus Vision Viewer 7880 from Ken-A-Vision is designed to replace traditional overhead project technology with a digital, cross-platform, auto-focus, camera solution. This unit is compatible with PC, Mac, and Linux computers and includes a pre-attached USB cable. It supports resolutions up to 1280 x 1040 SXGA. It includes Applied Vision 4 software, an MSI-compatible application for image capture, movies, time-lapse effects, rotation, and brightness & contrast controls, among many other functions. 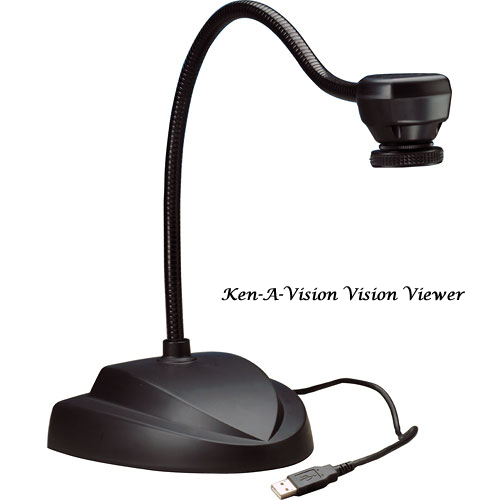 The Ken-A-Vision Vision Viewer 7890B is a 1/4" CCD presenter designed to be used as a classroom or lecture camera. 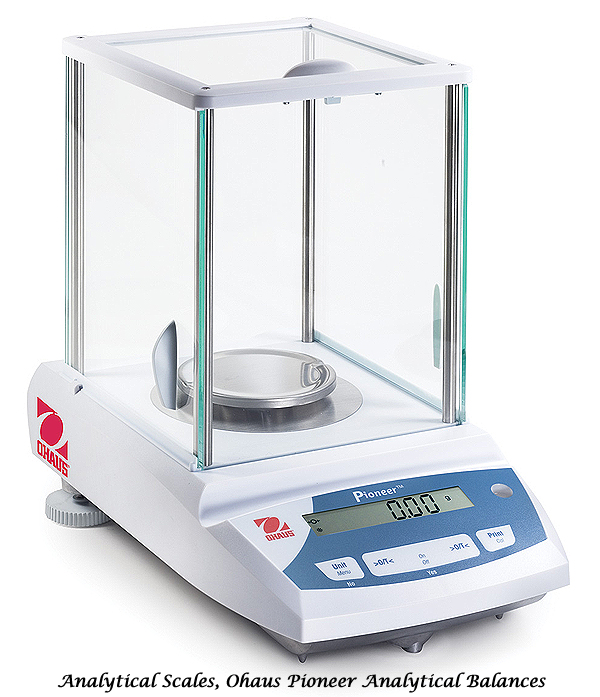 The unit has a flexible gooseneck and outputs video to both NTSC and PAL standards. The camera integrates a lens that can be used to display text, flat art, or 3-dimensional items onto televisions or projectors. The camera produces high-quality images, providing exceptional benefits for the classroom and beyond. The Vision Viewer 7890B plugs directly into any device with composite video inputs. Unlike many comparable products, the Vision Viewer is capable of display images in both NTSC (United States, Japan) and PAL (Europe, Australia) signal standards. No matter where you are in the world, the 7890B has it covered. The 20" gooseneck allows the camera to be aimed at almost anything, from tabletop text to wall mounted maps, or even the lecturer themselves. 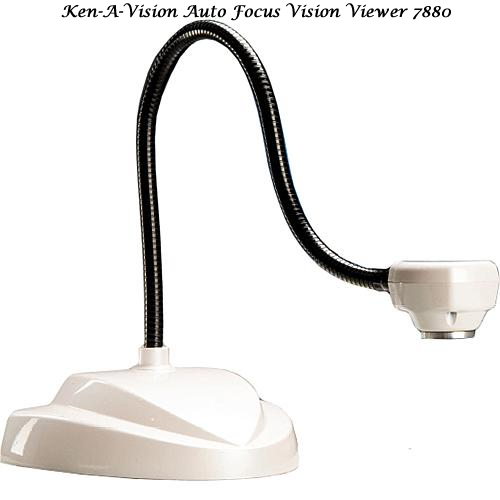 The Ken-A-Vision Vision Viewer 7890UM is a high resolution 1/3" CMOS presenter designed to be used as a classroom or lecture camera. 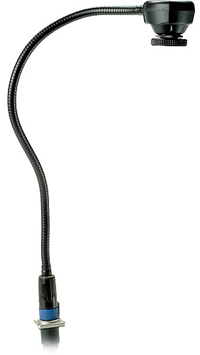 The unit has a flexible gooseneck and outputs video via a dedicated USB connector. The camera integrates a lens that can be used to display text, flat-art or 3-dimensional items onto computer monitors or through data projectors. This camera produces high quality images, providing exceptional benefits for the classroom and beyond. The Vision Viewer 7890UM plugs directly into any USB-equipped computer. The USB allows image output and also provides power to the camera. Objects, flat art and text can be displayed clearly on monitors or data projectors. The camera comes ready with Applied VisionTM software for easy manipulation of images and movies. The 7890UM outputs at 1280 x 960, making it perfect for high resolution imaging including viewing scientific specimens and small objects. The 20" gooseneck allows the camera to be aimed at almost anything, from tabletop text to wall mounted maps or even the lecturer themselves. 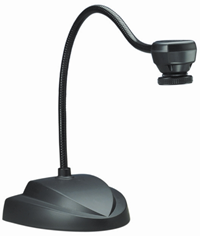 Now teachers can use the BookCAM visual presenter to expand students' minds while reading. Simply connect the pre-attached video cable to a TV monitor or LCD projector and clip the camera to your book. This unique camera is set to allow you to view the picture on a monitor just as you see it! Watch your students get excited about reading while they read along with you. 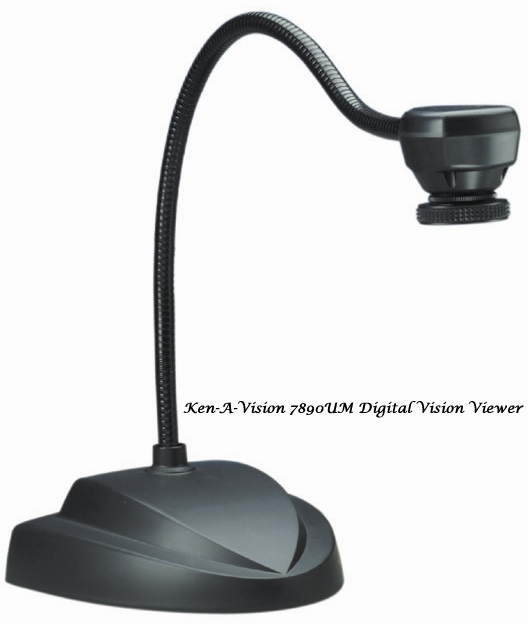 The Ken-A-Vision 7811 BookCAM is a video presenter designed to be used as a classroom or lecture camera aid. The BookCAM is built to easily attach to textbooks and features a flexible gooseneck. With its simple output to standard composite video, the BookCAM can be used with virtually any television set. Flexible Camera Positioning: The extented gooseneck allows the camera to be aimed at almost anything, from text to wall mounted maps or even the lecturer. 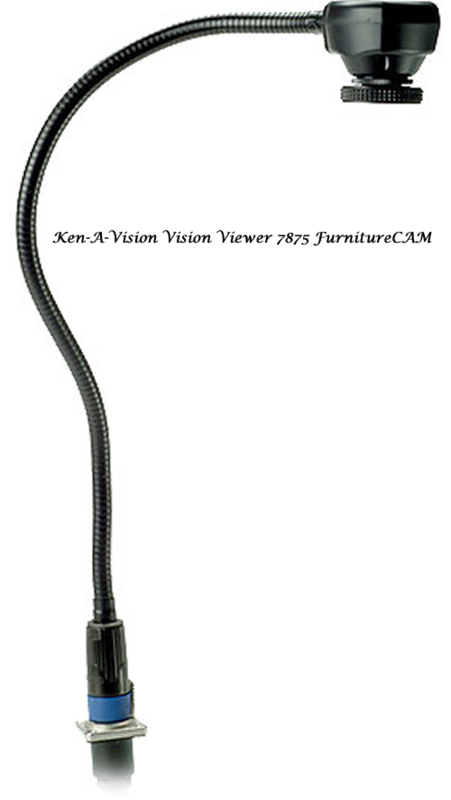 The FurnitureCAM by Ken-A-Vision is the ideal camera to use for presenting a number of subjects. Its flexible neck and easy-to-focus lens allow the user to focus on something from as close as a half inch away to across the room. This camera is PC and MAC compatible and comes complete with Applied Vision Software, which allows the user to capture images, record movies, launch video streaming and much more! The Ken-A-Vision Video 7875 is a camera designed to be used with Diversified Woodcrafts, Inc products, including their line of desks and carts. 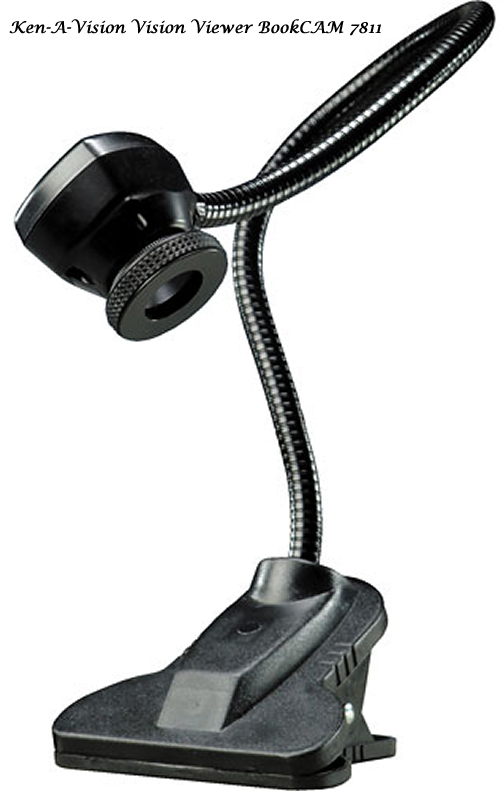 The camera's flexible head allows it to pose to virtually any angle. The 20" gooseneck allows the camera to be aimed at almost anything, from tabletop sample to a wall mounted periodic table or even the lecturer themselves. Go from 2.6mm to infinity with only a 1/4" a turn for quick focus adjustments on the fly. Presenters can adjust pictures mid-lecture with no hassle.